It’s been a beautiful fall! It was so colourful out here in the woods. Most of the leaves have fallen off of the trees now and only the Beech tree leaves are hanging on, golden brown and rustling in the wind. 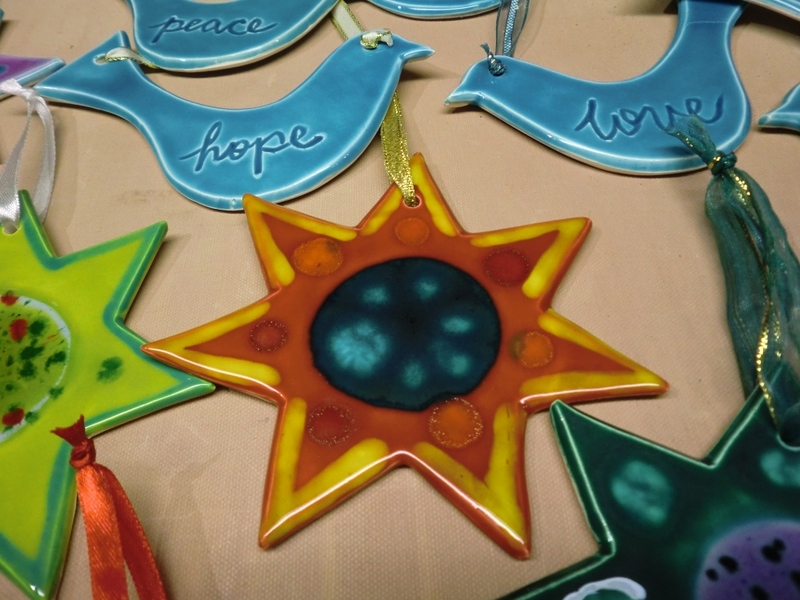 In the pottery I’m glazing 7 pointed star tree decorations. Every one of them is a unique piece, never to be repeated twice. It is impossible to replicate a piece when making things by hand and one-by-one. Each star is hand cut and after the stars are bisque fired I paint on layers and layers of glaze for an amazing and dazzling finish. Here’s an example of some I’ve made in recent years. Doves and 7 pointed star, “Star Brite.” White earthenware with layered glazes and bursting crystal glaze centre. For November and December I’ll be at 4 artisan and craft sales in the Ottawa/Gatineau region. The first one is on Saturday, November 8 at Buckingham Elementary School, 615 rue Georges. The sale starts at 9 a.m. and goes until 4 p.m. Last year there was no craft sale in Buckingham, but this sale is sure to get you started on the right foot where gift shopping is concerned. There will be artisans there who make jewelry, wood sculptures, home decor, knitwear and of course I’ll be there with my pottery. Proceeds from the table rentals (a fee that we artisans pay to be there) go to the school for various student activities. It’s a win-win! Come out and support local art! This entry was posted in my work, shameless self-promotion. Bookmark the permalink.